Occupational Asthma, or The Flue? 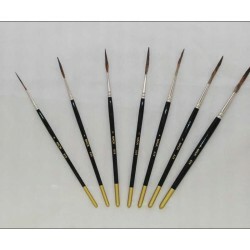 Mack Series 839 Out-liner Brushes, These brushes are made from pure brown Kazan Squirrel and Black Ox mixture hairs. They have a nickel ferrule and black and gold handles. The 839 is much softer than Mack's 838 out-liner and will carry more paint. These Out-liner brushes are used for outlining letters, for scroll work, and applicable sign work. The series 839 is suitable for most surfaces. It has a round ferrule and graduated hair lengths. Mack brush outliner brush series 839 full set , sizes 0-6. The brush hair is brown Kazan squirrel and black ox mixture, it has a round nick..
Outliner Brush Size 0 Series 839 Mack Brush Series 839 Size 0, Hair Length 1". The brush hair is Brown Kazan Squirrel and Black Ox Mixture, it has a ..
Outliner Brush Size 1 Series 839 by Mack Brush, Hair Length 1-1/16". The brush hair of this Out-liner is Brown Kazan Squirrel and Black Ox Mixture; i..
Outliner Brush Size 2 Series 839 Mack Brush Series 839 Size 2, Hair Length 1-1/8". The brush hair is Brown Kazan Squirrel and Black Ox Mixture; it ha..
Outliner Brush Size 3 Series 839 Mack Brush Series 839 Size 3, Hair Length 1-1/4". The brush hair is Brown Kazan Squirrel and Black Ox Mixture; it ha..
Outliner Brush Size 4 Series 839 Mack Brush Series 839 Size 4, Hair Length 1-3/8". The brush hair is Brown Kazan Squirrel and Black Ox Mixture; it ha..
Outliner Brush Size 5 Series 839 Mack Brush Series 839 Size 5, Hair Length 1-1/2". The brush hair is Brown Kazan Squirrel and Black Ox Mixture; it ha..
Outliner Brush Size 6 Series 839 Mack Brush Series 839 Size 6, Hair Length 1-9/16". The brush hair is Brown Kazan Squirrel and Black Ox Mixture; it h..